makeshift hurdle of beer crates and painted logs. lovingly drapes a blanket over Luna to keep her warm. It’s a lot of work “but I enjoy it,” Mayer said. she feels like it, that is. Switzerland on how to deal with “steering” problems. it was quite common to ride cows and use them as workhorses. 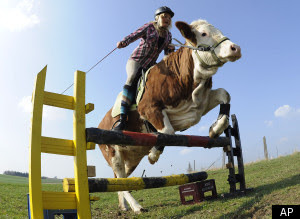 Being – and owning – a cow-turned-pony isn’t always easy. had to be won over. her, Luna’s fellow cows weren’t so open-minded. And horses? Many run away in fright, but others often join Luna on rides. “She really enjoys that and gets totally into it,” Mayer said. one. But she says Luna will always have a special place in her heart. “She’ll stay my darling,” she said. This entry was posted in Cow, Training on September 26, 2012 by yourfriends. Halloween is only 5 weeks away! We are hosting a pet costume contest, judged by the staff of KAH. 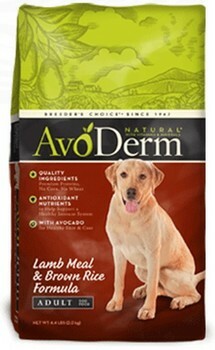 Email pictures to tech@kingsbrookvet.com. Please include your name, pets name, age and a short description. Entries will be accepted until Friday, October 26th. Winners will be announced on Facebook and be notified by email. PRIZES ARE AS FOLLOWS: 1st Place $50 credit on your Kingsbrook account, 2nd and 3rd Place $25 credit on your Kingsbrook account. 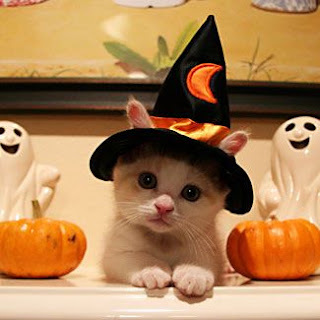 This entry was posted in Costume Contest, Halloween on September 20, 2012 by yourfriends. This entry was posted in Recall, salmonella on September 13, 2012 by yourfriends. This entry was posted in dogs, Teacher on September 12, 2012 by yourfriends. 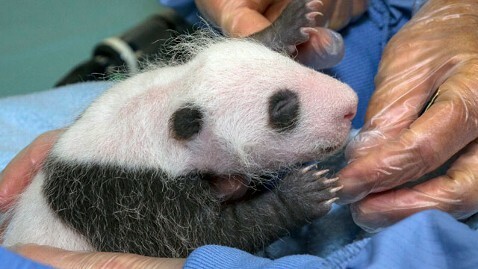 Good news from the San Diego Zoo: The baby panda born July 29 passed its first close-up physical examination. The panda was reported to be a robust 1.5-pounds, with a strong heart, good lungs, a calm demeanor, and a distinctive voice. The exam lasted but three minutes; the rule with panda cubs is for keepers to remain at a distance to let mother and baby bond properly. There were limits to what could be observed: Veterinarians are still not sure about the baby’s gender. While the exam was underway, keepers were watching mother Bai Yun to see if separation anxiety set in. It did not, zoo officials said. The cub is Bai Yun’s sixth offspring since arriving at the zoo. But repetition has not dulled her talent for motherhood. She quickly cradled the cub when the two were reunited, officials said. Plans are for Bai Yun and the offspring to remain in the den for several months, visible to the public on the zoo’s panda cam. This entry was posted in Baby Panda, San Diego Zoo on September 5, 2012 by yourfriends.